She shoots first, and asks for grants later. For her new documentary Maison du bonheur, the young Toronto filmmaker Sofia Bohdanowicz travelled to Paris to make a movie about the day-to-day goings of an elderly woman whom she knew little about and had no contact with in advance. "I may have been naive," Bohdanowicz says, "but I had a feeling it was going to go well." So the part-time filmmaker took out a loan and booked a month off her job at an assault prevention agency for children. She bought 30 rolls of 16mm film, packed up her hand-cranked '60s-vintage Bolex camera and purchased a flight to a country that she had only visited as a foreign-exchange student as a teenager. Her plan was to live with the subject of her film: A 77-year-old Parisian astrologer who had resided in the same Montmartre apartment for more than 50 years and who rarely received house guests. What could go wrong? A lot. But everything went fine for the DIY auteur – the stars, one might say, were aligned. 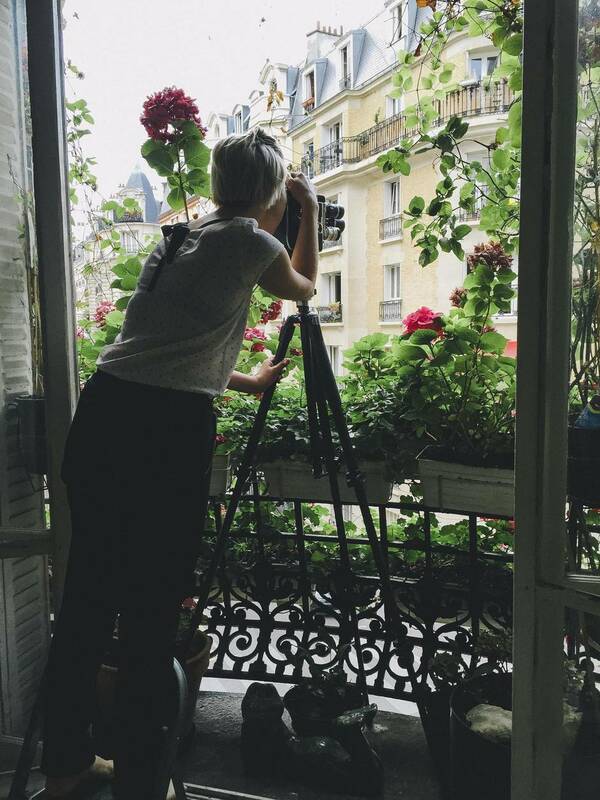 Sofia Bohadnowicz filming in Paris. The delightful Maison du bonheur, which makes its North American premiere at this year's Hot Docs Festival, is the 31-year's director's second feature film. The docudrama Never Eat Alone won her the "emerging Canadian director" award at 2016's Vancouver International Film Festival. Never Eat Alone studied Bohdanowicz's maternal grandmother in her attempt to reconnect with an ex-lover. Three years earlier, Bohdanowicz's poetic short film Dalsza Modlitwa dealt with her paternal grandmother. We're sensing a pattern. "I find the representation of elderly women in film today is very one-sided," says Bohdanowicz, sipping a local lager in the leather booth of a snazzy west-end hotel lounge. "They're tired, they're senile, they're bitter. But there's much more to what elderly people are." As a child, the stories of her grandparents became the films in her mind. As an adult, they became characters in the stories she tells. "What better narratives to put on screen than the ones I know and am personally attached to?" Those keeping score at home are aware that Bohdanowicz was fast running out of nanas. As fate would have it, a co-worker of hers, after seeing Dalsza Modlitwa, suggested Bohdanowicz make a film about her mother, Juliane Sellam, the Parisian astrologer. Although knowing little about Sellam, Bohdanowicz was game. On the other side of the Atlantic, before agreeing to take in a stranger and have her own life exposed to a camera lens, Sellam asked about Bohdanowicz's birth date. After working up the astrological chart on the filmmaker, the women agreed to the project. Maison du bonheur translates to "house of happiness," which is what the woman's home turns out to be. We learn about her daily habits and we look into her closet, literally. The spry, likeable lady has a stellar shoe collection, for one thing. "Old people have lived a long life, and the objects they own are attached to sagas," says Bohdanowicz. But as we learn about the film's subject, we also learn about the filmmaker. "You're impulsive," the astro-sleuthing senior tells Bohdanowicz. "And you're intuitive." Impulsive and intuitive – if Bohdanowicz weren't those things, the film probably would have never happened. "You overthink things," the woman continues. "It is," says Bohdanowicz, smiling as she finishes off her beer. "When it comes to test screenings and editing, I do tend to obsess." Bohdanowicz came back from France with 90 minutes of film, which she used for 60 or so minutes of documentary. That's a tight ratio. "I had to be stringent and precise when I shot," says the filmmaker, who ended up getting a government grant for post-production costs. Next fall, Bohdanowicz begins a masters program in film production at York University. More immediately, on the day after our interview, she flew to Buenos Aires for a retrospective of her work. Outside the hotel, she says she's finished her preparations for the trip. All packed, with places to go. Oh, and her sign? Gemini or Aries or whatever – but absolutely rising. Maison du bonheur screens May 3-5 at Hot Docs Festival (April 27 to May 7, hotdocs.ca).